Martin Schulz, 61, has taken over leadership of the Social Democratic party (SDP), in Germany. Schulz may pose a challenge to Merkel, who Stefan Wagstyl of the FT describes as: ‘Europe’s hitherto unassailable anchor and a beacon of stability for western democracies buffeted by populist rebellion’ (FT, 11.2.17). Schulz has been working for the EU for some twenty years. As the European Parliament President, he successfully expanded his own clout and that of the Parliament. In 2009, Parliament’s powers were increased under the Lisbon Treaty which gave them more of a say in the making of EU law. Most EU law now needs the European Parliament’s stamp of approval. Since Schulz replaced the unpopular Sigmar Gabriel as the SPD’s leader, their popularity rating has gone from less than 20% to around 30%. Where does he stand in German politics? He is Merkel’s junior coalition partner. Merkel represents the conservative party CDU/CSU coalition. In Schulz we have a: ‘newish-looking mainstream leader with an unconventional past that could be appealing’ (Wagstyl, FT). Wagstyl also says of him that: ‘ he remains something of an outsider – and therefore a novelty – among an elite that fawns on academic titles’. His weaknesses are a strength. His ‘ascent from a poor background … compelling’ (Alex Stagger, an SPD politician who knows Schulz well, quoted in Wagstyl’s FT article). He has made an ’emotional connection’ with the voters (FT, 6.2.17). When he was younger he wanted to be a professional football player but he got injured, so could not be. As a result, he became an alcoholic. After that, he opened a bookshop and became local mayor. He didn’t have a degree from university but read a great deal. He is married with two adult children. Schulz was born in 1955 in a German village near the Dutch/German border. His father was a policeman and his mother stayed at home. Shulz speaks English, French, Italian, Dutch and German (pluses of living so close to the border). 1987 was the beginning of his political career really when he became mayor of a market town, Wurselen, close to where he grew up. In 1994 Schulz was elected to the European Parliament. When Schulz was working there, he had close ties with European Union Commission President, Jean-Claude Juncker. When Juncker was under pressure vis-a-vis corporate tax deals, Schulz stood up for him showing him to have integrity and loyalty amidst a political storm. He is less stern than Merkel on fiscal policy. He believes that flexibility should be permitted for vulnerable countries, including Greece. He says that he is concerned about social justice. However, this may not be enough in such turbulent times. Security and traditional conservative values are where Merkel is strong. Sometimes in a crisis, people like to know where they stand; at other times, they want something totally different, untried and untested. It is impossible in the present political climate to predict just which way the political dice will fall. Support for the SPD has risen from 21% two weeks ago just before Schulz took over to 31%. They have gabbed some support from Merkel’s Christian Democrat/Christian Socialist block, down from 32.5% to 30%; and from some smaller parties, including the xenophobic AfD (FT, 6.2.17). Even if Schulz’s SPD party manage to come first in Germany’s September elections, this does not guarantee him sole power as the SPD are unlikely to gain the overall majority required to do so; they would have to seek a coalition. This would include renewing the alliance with Merkel’s CSU/CSU (albeit that the SPD would be in charge, as opposed to the way it is at present); or alternatively seeking a centre-left alliance with the Greens and the far left party. The AfD isn’t a serious contender. Whilst they may have soared in popularity as a result of the immigration question, it is unlikely that they will garner any significant mainstream support. In Germany, the EU still remains popular. 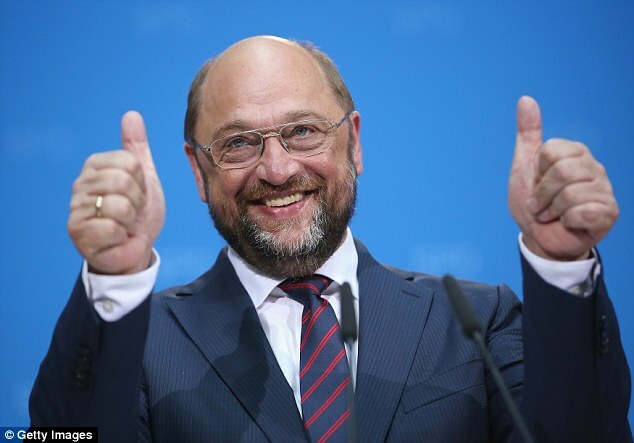 Who has replaced Schulz as European Parliament President? Antoine Tajani, a centre right Italian, aged 63. He will hold the position util 2019. He beat socialist rival Gianni Pittella, 58, by 69 votes: 351/282. Tajani started out as spokesman for Berlusconi when he was Italian Prime Minister. He became an MEP in 1994. His election marks a shift to the right from the centrist grand coalition in Brussels between the Socialists and the Democrats on the centre left and the European People’s Part on the centre right. Jean-Claude Juncker, centre-right European People’s party, was appointed European Commission president, in 2014. Donald Tusk, of the Polish liberal-conservative party Civic Platform, has headed the European Council since 2014.